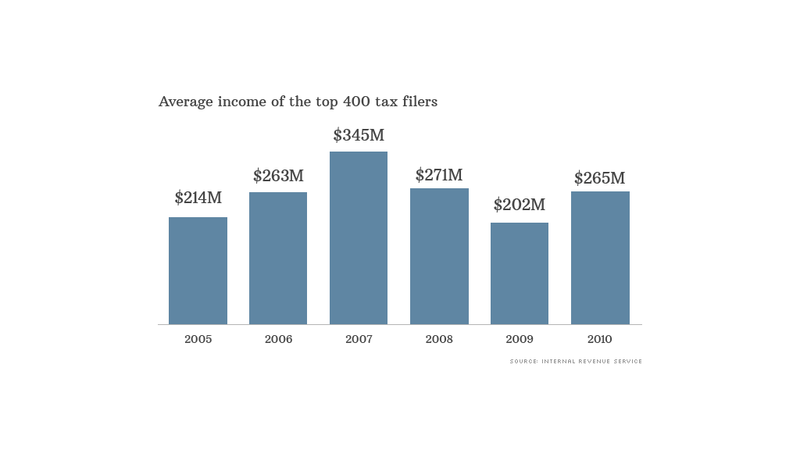 The top 400 richest taxpayers not only earned a lot more money in 2010 than in 2009, they also took a smaller tax hit. To be counted among the top 400 filers that year, you had to pull in at least $99 million, according to the latest data from the IRS. The average income among this select group: $265 million, up 31% from the year prior. The average tax bill, meanwhile, came to nearly $48 million. That means the group paid an average of 18% of their income in federal income taxes. Their average effective tax rate, as it's known, was actually down from nearly 20% in 2009. Of course, some paid much more and some paid much less. The IRS reports that 90 filers in the group had an average effective tax rate of 25% or more, while 37 filers paid less than 10%. The majority of Americans, meanwhile, pay below 15%. A key way the richest of the rich reduce their federal tax bill to less than a quarter of their income - and in some cases less than a tenth - is because so much of their income comes from capital gains and dividends, which are taxed at lower rates than ordinary salaries. Another reason: They can deduct an awful lot, not least of which are their large charitable contributions, which averaged $19 million. In fact, donations were the single biggest deduction this group took. If you think the top 400 tax filers are the same people year in and year out, think again. Between 1992 and 2010, more than 4,000 filers were counted in the top 400 at one time or another. "Most people are there only once," said Roberton Williams, a fellow at the Tax Policy Center. That's typically because outsized income is due to a one-time event like the sale of a business or other investment. Indeed, IRS data show that 2,909 of them made the cut for just one year, while only 95 people ranked in the group for 10 or more years.